To make the sambal, soak the dried chili pieces with boiling water until they are soften. Drain the chilies and make sure to get rid of the seeds. Then combine it with yellow onion, red chilies, shallots, shrimp paste and blend until they become a paste. Heat oil and cook the sambal paste on moderate to low heat. Cook until the sambal is fragrant. Then add the slice red onion. Give it a quick stir and mix in the tamarind mixture and season with sugar and salt. Add the prawns into the sambal mixture; stir briefly until the prawns are cooked. 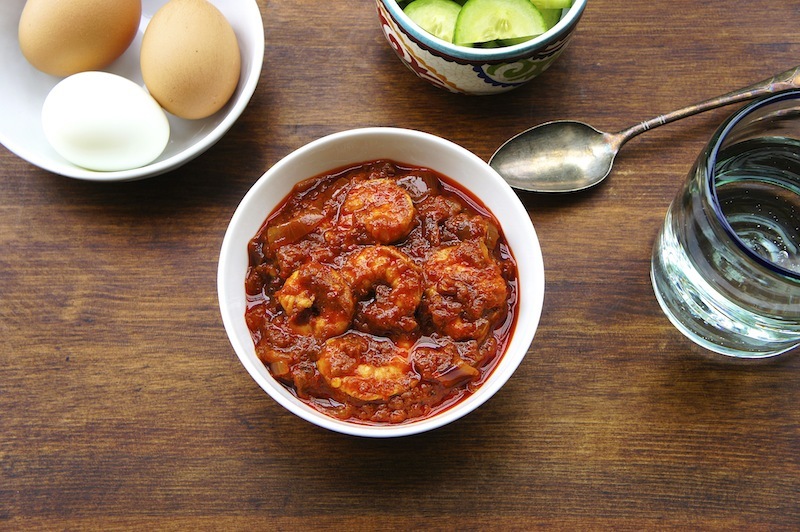 Serve the prawn sambal at room temperature with steamed rice. Angie, this sounds easy. Your sambal looks fiery red..mmmm I want to try this out for sure :) Can eat two bowls of rice :) Thanks for sharing such an easy to make Prawn sambal. this is good to eat with more more rice. This looks amazing Angie - just wondering about the onions though, does it matter if I just use yellow or red onions for the recipe? You can use both, but I prefer the yellow onion because it's sweeter. Oh my, your sambal tumis looks so good! Really need to try this!